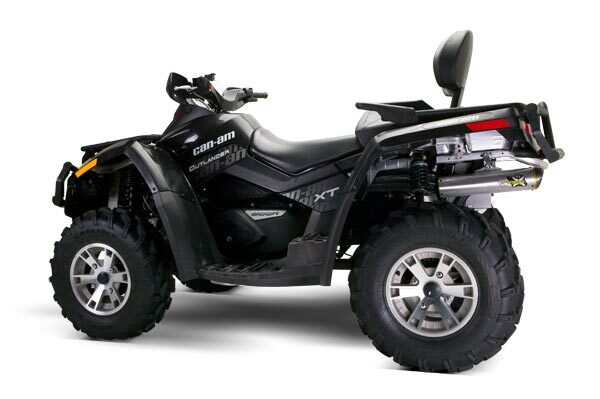 Can-Am Outlander MAX 800R (2009) M-7 Exhaust System: With the patented use of Magnesium, titanium, aluminum and stainless steel, and hours of testing, we have an exhaust system that performs for all levels. Whether you are on the racetrack, trail riding, woods riding or just having fun in the sand this exhaust performs. Performance gains are seen and felt in the critical lower and upper areas of the powerband. We are sure that when you pull this exhaust system out of the box, install it on your ATV, and feel the performance you will agree that it is The Absolute Top Level™. 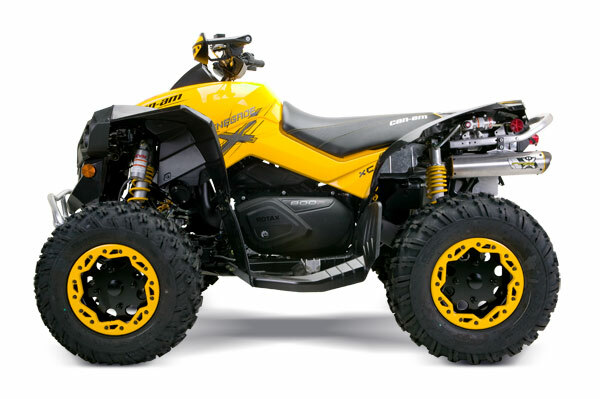 The newest exhaust system in the TBR ATV line-up is for Can-Am's Outlander Max 800R. Through extensive testing and development we have produced a winning combination of Top Level Performance on and off the racetrack with our new Outlander M-7 Exhaust System. The Two Bros M-7 off-road exhaust systems come complete with a removable screen type spark arrestor. 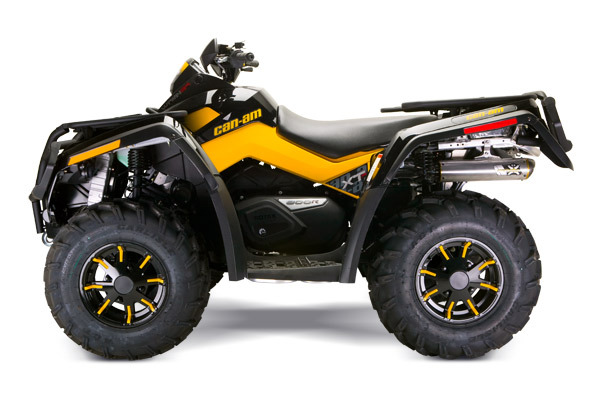 Can-Am Renegade 800R / Outlander (2007-10) M-7 Exhaust System: Headlining the release of their latest performance ATV system is a two-part affair with low weight and big power taking center stage. Two Bros’ new Stainless Steel/Aluminum slip-on takes 4.5 pounds off the Renegade and adds nearly 7 horsepower. Torque numbers jump up nearly 5 ftlbs. as well. Containing all this extra muscle is Two Brother’s trademarked V.A.L.E. connection system with X-Lite retaining ring and their rugged M-7 Muffler complete featuring their signature Teflon coated, blunted, cast magnesium end cap. Two Brothers Racing Top Level exhaust systems have been tested in the highest forms of professional motorcycle, ATV and UTV racing and in the trenches of true utility use. Unparalleled commitment to Top Level design, material quality and construction techniques have propelled Two Brothers Racing products to the forefront of power sports for speed enthusiasts and the motor-driven workforce alike. Our new M-7 V.A.L.E.™ exhaust systems feature our exclusive Teflon coated, blunted, cast magnesium outlet and our exclusive X-Lite™ retaining ring. These exclusive Two Brother Racing features not only look great, but also significantly reduce the weight of the exhaust system. The V.A.L.E.™ inlet design eliminates the use of springs and creates an adjustable mount that is rock solid when fixed in place. The system also features a precision mandrel bent, thinwall s-bend tube, and for a full system, a header pipe custom fit for each model.